Uganda is a landlocked country in East Africa, bordered by Kenya(Kenya tours) in the East, in the north by South Sudan, in the West by the Democratic Republic of the Congo, in the southwest by Rwanda(Rwanda tours), and in the south by the Republic of Tanzania. The southern part of the country includes a substantial portion of Lake Victoria, which is also shared by Kenya and Tanzania. Uganda takes it’s name from the Buganda kingdom, which encompasses a large portion of the country including the great capital city Kampala. The people of Uganda were hunter-gatherers until 1,700 to 2,300 years ago, when Bantu-speaking populations migrated to the southern parts of the country. Uganda gained independence from Britain on 9 October 1962. The official languages are English and Swahili, although multiple other languages are spoken in the country. The country is located on the East African plateau, lying mostly between latitudes 4°N and 2°S (a small area is north of 4°), and longitudes 29° and 35°E. It averages about 1,100 meters (3,609 ft) above sea level, and this slopes very steadily downwards to the Sudanese Plain to the north. However, much of the south is poorly drained, while the centre is dominated by Lake Kyoga, which is also surrounded by extensive marshy areas. Uganda lies almost completely within the Nile basin. The Victoria Nile drains from lake Victoria into Lake Kyoga and hence into Lake Albert on the Congolese border. It then runs northwards into South Sudan. One small area on the eastern edge of Uganda is drained by the Turkwel River, part of the internal drainage basin of Lake Turkana. Lake Kyoga serves as a rough boundary between Bantu speakers in the south and Nilotic and Central Sudanic language speakers in the north. Despite the division between north and south in political affairs, this linguistic boundary runs roughly from northwest to southeast, near the course of the Nile. However, many Ugandans live among people who speak different languages, especially in rural areas. 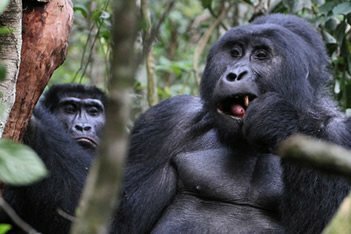 Some sources describe regional variation in terms of physical characteristics, clothing, bodily adornment, and mannerisms, but others claim that those differences are disappearing, hence making Uganda a good destination for mini safaris as you will be able to encounter lots of exciting wildlife in a short time. Although generally equatorial, the climate is not uniform as the altitude modifies the climate. Southern Uganda is wetter with rain generally spread throughout the year. At Entebbe on the northern shore of Lake Victoria(Victoria Ngamba Island Tours), most rain falls from March to June and in the November/December period. Further to the north a dry season gradually emerges; at Gulu about 120 km from the South Sudanese border, November to February is much drier than the rest of the year. The northeastern Karamoja region(Kidepo National Park Tour) has the driest climate and is prone to droughts in some years. Rwenzori(Mt.Rwenzori mountaineering tours), a snow peaked mountainous region on the southwest border with Congo (DRC), receives heavy rain all year round and is the source of the Nile. The south of the country is heavily influenced by one of the world’s biggest lakes, Lake Victoria, which contains many islands. It prevents temperatures from varying significantly and increases cloudiness and rainfall. Most important cities are located in the south, near Lake Victoria, including the capital Kampala(Kampala city day tour) and the nearby city of Entebbe. Although landlocked, Uganda contains many large lakes; besides Lake Victoria and Lake Kyoga, there are Lake Albert, Lake Edward and the smaller Lake George. For decades, Uganda’s economy suffered from devastating economic policies and instability, leaving Uganda as one of the world’s poorest countries. The country has commenced economic reforms and growth has been robust. In 2008, Uganda recorded 7% growth despite the global downturn and regional instability. Uganda has substantial natural resources, including fertile soils, regular rainfall, and sizable mineral deposits of copper and cobalt. The country has largely untapped reserves of both crude oil and natural gas. While agriculture accounted for 56% of the economy in 1986, with coffee as its main export, it has now been surpassed by the services sector, which accounted for 52% of percent GDP in 2007. In the 1950s the British Colonial regime encouraged some 500,000 subsistence farmers to join co-operatives. Since 1986, the government (with the support of foreign countries and international agencies) has acted to rehabilitate an economy devastated during the regime of Idi Amin and the subsequent civil war. Inflation ran at 240% in 1987 and 42% in June 1992, and was 5.1% in 2003. Between 1990 and 2001, the economy grew because of continued investment in the rehabilitation of infrastructure, improved incentives for production and exports, reduced inflation and gradually improved domestic security. Ongoing Ugandan involvement in the war in the Democratic Republic of the Congo, corruption within the government, and slippage in the government’s determination to press reforms raise doubts about the continuation of strong growth. In 2000, Uganda was included in the Heavily Indebted Poor Countries (HIPC) debt relief initiative worth $1.3 billion and Paris Club debt relief worth $145 million. These amounts combined with the original HIPC debt relief added up to about $2 billion. In 2006 the Ugandan Government successfully paid all their debts to the Paris Club, which meant that it was no longer in the (HIPC) list. Growth for 2001–2002 was solid despite continued decline in the price of coffee, Uganda’s principal export. According to IMF statistics, in 2004 Uganda’s GDP per capita reached $300, a much higher level than in the 1980s but still at half the Sub-Saharan African average income of $600 per year. Total GDP crossed the 8 billion dollar mark in the same year. Economic growth has not always led to poverty reduction. Despite an average annual growth of 2.5% between 2000 and 2003, poverty levels increased by 3.8% during that time. This has highlighted the importance of avoiding jobless growth and is part of the rising awareness in development circles of the need for equitable growth not just in Uganda, but across the developing world. Uganda traditionally depends on Kenya for access to the Indian Ocean port of Mombasa. Recently, efforts have intensified to establish a second access route to the sea via the lakeside ports of Bukasa in Uganda, and Musoma in Tanzania, connected by railway to Arusha in the Tanzanian interior and to the port of Tanga on the Indian Ocean. Uganda is a member of the East African Community and a potential member of the planned East African Federation. Uganda has a large Diaspora – residing mainly in the United States and the United Kingdom. This Diaspora has contributed enormously to Uganda’s economic growth through remittances and other investments (especially property). According to the World Bank, in 2010/2011 Uganda got $694 million in remittances from Ugandans abroad, the highest foreign exchange earner for the country. Uganda also serves as an economic hub for a number of neighbouring countries like the Democratic Republic of Congo, South Sudan and Rwanda. The Ugandans were hunter-gatherers until 1,700 to 2,300 years ago. Bantu-speaking populations, who were probably from central Africa, migrated to the southern parts of the country. These groups brought and developed iron working skills and new ideas of social and political organization. The Empire of Kitara covered most of the great lakes area, from Lake Albert, Lake Tanganyika, Lake Victoria, to Lake Kyoga. Its leadership headquarters were mainly in what became Ankole, believed to have been run by the Bachwezi dynasty in the fourteenth and fifteenth centuries, who may have followed a semi-legendary dynasty known as the Batembuzi. Bunyoro-Kitara is claimed as the antecedent of later kingdoms; Buganda, Toro, Ankole and Busoga. The Nilotic Luo invasion is believed to have led to the collapse of the Chwezi Empire. The twins Rukidi Mpuuga and Kato Kintu are believed to be the first kings of Bunyoro and Buganda after the Chwezi Empire collapsed, creating the Babiito and Bambejja Dynasty. Nilotic people including Luo and Ateker entered the area from the north, probably beginning about A.D. 120. They were cattle herders and subsistence farmers who settled mainly in the northern and eastern parts of the country. Some Luo invaded the area of Bunyoro and assimilated with the Bantu there, establishing the Babiito dynasty of the current Omukama (ruler) of Bunyoro-Kitara. Luo migration continued until the 16th century, with some Luo settling amid Bantu people in Eastern Uganda, with others proceeding to the western shores of Lake Victoria in Kenya and Tanzania. The Ateker (Karamojong and Iteso) settled in the northeastern and eastern parts of the country, and some fused with the Luo in the area north of Lake Kyoga. Arab traders moved inland from the Indian Ocean coast of East Africa in the 1830s. They were followed in the 1860s by British explorers searching for the source of the Nile. Protestant missionaries entered the country in 1877, followed by Catholic missionaries in 1879. The United Kingdom placed the area under the charter of the British East Africa Company in 1888, and ruled it as a protectorate from 1894. As several other territories and chief doms were integrated, the final protectorate called Uganda took shape in 1914. From 1900 to 1920, a sleeping sickness epidemic killed more than 250,000 people, about two-thirds of the population in the affected lake-shore areas. Tourism in Uganda is focused on Uganda’s landscape and wildlife.Uganda Safaris exposes very diverse cultures, landscape, flora, and fauna. In the late 1960s, Uganda had a prosperous tourist industry with 100,000 visitors each year. Tourism was the country’s fourth largest earner of foreign exchange. The tourist industry ended in the early 1970s because of political instability. By the late 1980s, Uganda’s political climate had stabilized and conditions were suitable for reinvestment in Uganda’s tourist industry. However, the loss of charismatic wildlife in previously popular safari parks such as Murchison Falls National Park and Queen Elizabeth National Park prevented these parks from competing with similar tourist attractions in neighboring Kenya and Tanzania. 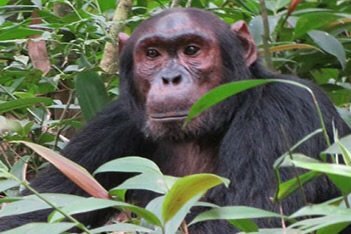 Uganda’s tourist industry instead promoted its tropical forests. The keystone of the new industry became Bwindi Impenetrable National Park. With more than 300 Mountain Gorillas, Bwindi Impenetrable National Park has approximately half of the world’s population of Mountain Gorillas(Gorilla trekking safaris). About three-quarters of Uganda’s tourists are from other African countries. Kenya, which borders Uganda, is the biggest source of tourists to Uganda, making up almost half of all arrivals into the country. The number of visitors from Tanzania, Rwanda, the Democratic Republic of the Congo, and Sudan is quite low. As Uganda is a landlocked country, it is very dependent on connections through Kenya for most of its transport. International travelers sometimes prefer to fly into Nairobi before connecting to Uganda’s capital Kampala as this is often cheaper. Tourism in Uganda is an important generator of foreign exchange, high-end employment, and investment. There has been increased investment in tourism, particularly in travel accommodation and related facilities; this has enhanced tourists’ experience in the country. Adventure tourism , ecotourism and cultural tourism are being developed. 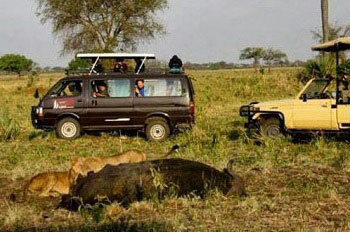 Internal and external security threats can cause issues for Uganda’s tourism industry. The conflicts in neighboring southern Sudan and eastern Democratic Republic of the Congo often create cross border conflicts that have damaged the development of tourism in the country, such as the killing of tourists in the Rwenzori Mountains National Park. Uganda has been among the rare HIV success stories, one of the reasons being openness. In the 1980s, more than 30% of Ugandan residents had HIV; this had fallen to 6.4% by the end of 2008, the most effective national response to AIDS of any African country. This is supported by the findings of a 2006 study that modern contraceptive use in Uganda is low. However, there has been a spike in recent years compared to the mid-nineties, especially after a shift in US Aid Policy toward abstinence only campaigns (starting in 2003 with the President’s Emergency Plan for AIDS Relief under U.S. President George W. Bush). According to one report by Uganda’s Aids commissioner, the number of new HIV infections has almost doubled from 70,000 in 2003 to 130,000 in 2005. Researchers have found that rates of new infection have stabilized as of 2005 due to a variety of factors, including increased condom use and sexual health awareness. Meanwhile, the practice of abstinence was found to have decreased. Life expectancy at birth is estimated to be 53.45 years in 2012. The infant mortality rate is approximately 61 deaths per 1,000 children in 2012. There were 8 physicians per 100,000 persons in the early 2000s. The 2006 Uganda Demographic Health Survey (UDHS) indicates that roughly 6,000 women die each year due to pregnancy-related complications. However, recent pilot studies by Future Health Systems have shown that this rate could be significantly reduced by implementing a voucher scheme for health services and transport to clinics. Illiteracy is common in Uganda, particularly amongst females. Public spending on education was at 5.2 % of the 2002–2005 GDP. Much public education in primary and secondary schools focuses upon repetition and memorization. There are also state exams that must be taken at every level of education. Uganda has both private and public universities. The largest university in Uganda is Makerere University, located outside of Kampala. The system of education in Uganda has a structure of 7 years of primary education, 6 years of secondary education (divided into 4 years of lower secondary and 2 years of upper secondary school), and 3 to 5 years of post-secondary education. The present system has existed since the early 1960s. Although some primary education is compulsory under law, in many rural communities this is not observed as many families feel they cannot afford costs such as uniforms and equipment. State schools are usually run by the Church of Uganda and are built on land owned as such. In primary education, children sit exams at the end of each academic year in order to discern whether they are to progress to the next class; this leads to some classes which include a large range of ages. Upon completing P7 (The final year of primary education), many children from poorer rural communities will return to their families for subsistence farming. Secondary education is focused mainly in larger cities, with boarding optional. Children are usually presented with an equipment list which they are to obtain at the beginning of their time at secondary school. This list classically includes items such as writing equipment, toilet roll and cleaning brushes, all of which the student must have upon admission to school.